and arbitrations over the last seven years. Not just the biggest—also the best. 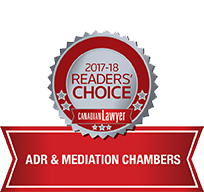 ADR Chambers has Canada’s top mediators and arbitrators. ADR Chambers also provides training, ombuds, and other dispute resolution services throughout Canada and internationally. ADR Chambers Named One of Canada’s Top ADR Organization by Canadian Lawyer. 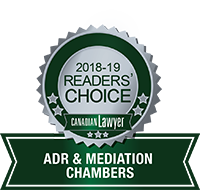 In October 2018, Canadian Lawyer Magazine conducted a survey to determine the Top 3 ADR and Mediation Chambers in Canada. ADR Chambers is proud to have been selected. A time-saving and cost-effective process similar to that outlined for mandatory mediation sessions in the Ontario Rules of Civil Procedure. The fees range from $600 to $825 plus HST, depending on the number of parties, and include one-half hour of preparation time for each party and up to three hours of actual mediation. For a list of the ADR Chambers roster rate mediators and for more information, please click here. Click to see Model Mediation and ArbitrationClauses. ADR Chambers offers fast and inexpensive Expedited Arbitration. The fixed fee is $7,500 plus HST per party for everything including the arbitrator’s fees, the room rental fees and the administration fees. Fees are lower for In-Writing arbitrations and Final Offer Selection Arbitrations. To see the new Expedited Arbitration Rules, please click here. To book an Expedited Arbitration, please contact us. Not everyone in a dispute is in the same city. The cost and time of traveling out of town for a mediation can be an impediment to scheduling and proceeding with a mediation. Now there’s a solution. eVideo mediations allow parties and lawyers to have a mediation in real time where people are in different cities. Read a Lawyers Weekly article about eVideo Mediation. Through the Stitt Feld Handy Group, ADR Chambers offers alternative dispute resolution workshops, negotiation workshops and workshops on dealing with difficult people. Please visit the Stitt Feld Handy Group website for more details.